Not just about being green! Hey there! Thanks for dropping by slightlyturquoise! Take a look around and grab the RSS feed to stay updated. See you around! With the garden no longer frozen solid, I thought now might be a good time to start work on my proposed new potato patch, but I’ve struck a bit of a problem. The first three or four spadefuls of soil were fine, but then I hit some very stoney ground, which promptly turned out to be…old tarmac. It appears I’ve chosen a spot which at one time was a wide path, or perhaps hard standing for a shed or similar. 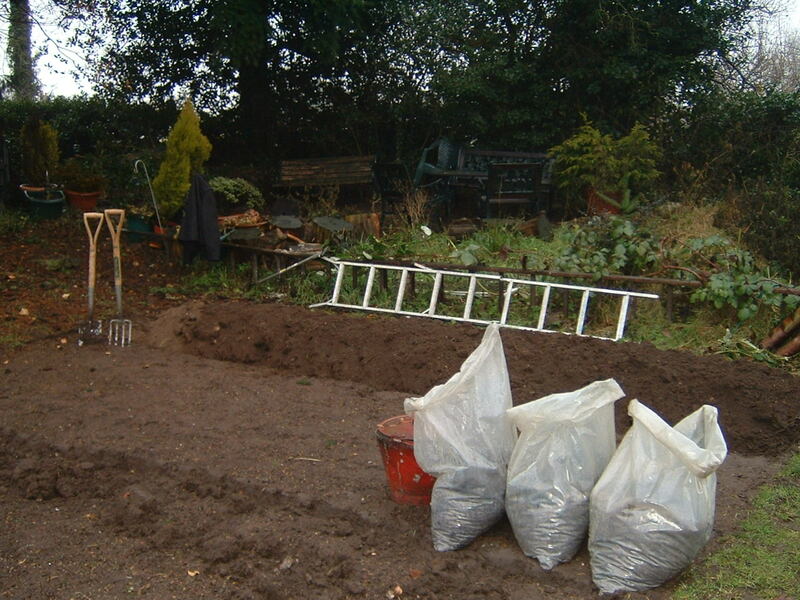 I’ve started work at the other end of the plot which is – thankfully – all soil so far, but I may have to have a re-think about the size and shape of the plot. Or perhaps I’ll go for raised beds instead at the tarmac end. As this patch has just been grassed over for ages, I’m digging in a mix of compost from our heap, well-rotted horse manure and a bit of ash from the fire. Not very scientific, and not sure exactly what potatoes require, but I thought this should provide a good mix of nutrients. In any case, we’ve grown potatoes two years running in broadly the same area, which is an no-no according to all the books, so this has to be an improvement. Keep on going with the digging – always thought that double-digging sounds far more romantic than it actually is in reality! I want a paper log maker though have no practical use for it in London! « Last Day of Advent! Find out how to build a greenhouse made from plastic bottles! Tom Hodgkinson's webpage "The Idler"